Learn how to get banana tree to fruit if your banana tree is not flowering and bearing fruit? Some people complain that their banana plants are not flowering and fruiting. The question is how to get a banana tree to produce fruit. A banana tree produces fruits every year under ideal conditions. Not getting enough fruits on the banana tree may be due to several reasons. Getting a banana tree to flowering and fruiting may be possible if you consider the following tips for encouraging the tree to flower. Note that all the varieties of banana trees do not produce edible fruit. Some varieties are grown for their flowers. Plant the rhizomes which are know to produce fruits. Banana tree needs warm climate, 10 to 15 months of frost-free weather. If not, the plant may not flower and there may not be any fruit. The plant stops growing when the temperature of the soil dips below 15°C (60°F). Fruits grow best when the temperature is around 30°C (85°F). You can wrap an old blanket around the tree, from top to ground to keep the plant warm. In the case of frost, wet the soil to reduce the effect on underground rhizomes. The soil should have a pH between 5.5 and 7.0. You can add decaying plant leaves, animal bones, pine sawdust or wood chips and azalea potting mix that make the soil rich in organic matter. Banana plant do not form flowers and fruits in saline soils. So make the soil fertile by adding composted organic matter. Banana plant requires a lot of water. 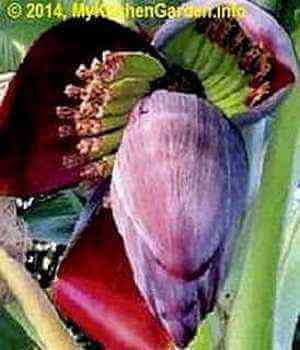 Banana tree flowers and produce fruit if the roots remain damp throughout the year. Always water deeply. Also sprinkle on the leaves to increase the humidity level around the plant. Apply about 5 inch layer of organic mulch on the root zone to keep moisture.